Although I usually give lip service to hunting ammunition, it's difficult for me to get excited about it. Until now. Over the years, I've learned that pheasant require a much different shell than other upland game birds. When I was a novice, I showed up with 20 ga. 2 3/4" 71/2's. Sadly, I knocked down a lot of birds, but 80% were runners- a broken wing the main injury. That is no way to treat a gamebird. I moved in to larger shot- 4's and 5's- and, finally, to the 3" magnum shell. By now, 75% are dead when they hit the ground and 1 in 4 are runners. This last trip, I needed shells and came across the Prairie Storm, shown above. $20 a box! You've got to be kidding me! The guy in the gas station (yes, gas station in North Dakota) told me he sells out as fast as he can get them in. The only reason he had these left was because it was 20 ga. ammo! They appear to be an improvement on the standard shell, with two types of shot in each shell- hard round shot and, additionally, some bladed shot (round, with a ridge around the equator). I will tell you what my observations were. Over the same dogs, shooting the same distances, same shot size, with the same guns, 95% of the birds were dead when they hit. Since I'm not a statistician, I don't have written records, but I do have non-scientific, old man, bird hunter, I-know-what-I-see fact. 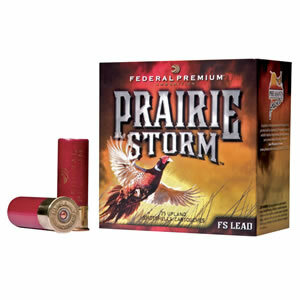 These shells knock the snot out of pheasant and are worth every penny you spend to get them. These are a BUY.